Born near Culloden, Georgia on April 17, 1912, she was the youngest of twelve children. She attended Fort Valley State College and then became a public school teacher in Macon, where she was married to Wilbur Robinson for a short time. Five years later, she went to Atlanta, where she earned an M.A. in English at Atlanta University. After teaching in Texas she then accepted a position at Alabama State College in Montgomery. :9 It was there she joined the Women's Political Council, which Mary Fair Burks had founded three years earlier. In 1949, Robinson was verbally attacked by a bus driver for sitting in the front "Whites only" section of the bus. Her response to the incident was to attempt to start a protest boycott. But, when she approached her fellow members of the Women’s Political Council with her story and proposal, she was told that it was “a fact of life in Montgomery.” In late 1950, she succeeded Burks as president of the WPC and helped focus the group's efforts on bus abuses. Robinson was an outspoken critic of the treatment of African-Americans on public transportation. She was also active in the Dexter Avenue Baptist Church. Robinson was the target of several acts of intimidation. In February, 1956, a local police officer threw a stone through the window of her house. Then two weeks later, another police officer poured acid on her car. Then, the governor of Alabama ordered the state police to guard the houses of the boycott leaders. The boycott lasted over a year because the bus company would not give in to the demands of the protesters. After a student sit-in in early 1960, Robinson and other teachers who had supported the students resigned their positions at Alabama State College. Robinson left Alabama State College and moved out of Montgomery that year. She taught at Grambling College in Louisiana for one year then moved to Los Angeles and taught English in the public school system. In Los Angeles, she continued to be active in local women's organizations. She taught in the LA schools until she retired from teaching in 1976. 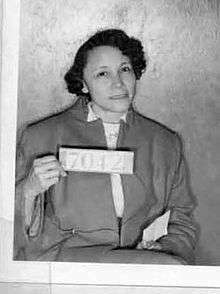 Jo Ann Robinson was also a part of the bus boycott, and was strongly against discrimination. ↑ Hine, Darlene Clark (2005). Black Women in America An Historical Encyclopedia. Oxford University Press. pp. 69–70. ISBN 0-19-515677-3. ↑ Smith, Jessie Carney (1996). Notable Black American Women, Volume 2. Detroit: Gale Research. pp. 562–4. ISBN 978-0-8103-9177-2. 1 2 3 4 "Robinson, Jo Ann Gibson (1912-1992)". King Papers Project; Stanford University. Retrieved September 13, 2013.